Did you ever hear about the time President Ford told New York City to “Drop Dead?” That was forty-four years ago – I wasn’t even born yet – but I know exactly how New Yorkers felt then, because that’s EXACTLY how we feel now about Governor Cuomo’s failure to address our homelessness crisis. President Ford refused spend a single penny then to help the city recover from its worst recession in history. And now Cuomo refuses to spend a cent to help homeless New Yorkers. New York is in a homelessness crisis – one that’s getting worse every day. There are 89,000 New Yorkers sleeping in shelters every night, and many thousands more in the streets. Homelessness is up 50 percent in the city under Governor Cuomo and up 36 percent statewide, including in Albany, Binghamton and Rochester. 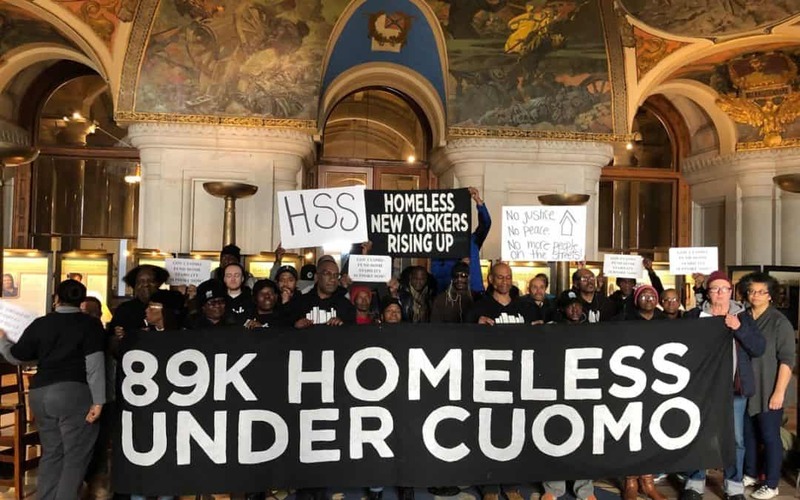 That’s why I joined VOCAL-NY and homeless individuals from across the state in a 24-hour vigil to demand funding for Home Stability Support (HSS), a rent subsidy that will keep thousands of low-income New Yorkers in their homes, and rehouse those already homeless. Twelve of us were arrested when they closed the Capitol for the night – but we came back the next morning and continued our protest. HSS doesn’t solve all of our problems, but it’s a massive step in the right direction, and the right thing to do. What is Cuomo’s response to our homeless crisis? Nothing. Cuomo’s obsessed with congestion pricing in midtown and taxing second homes in Manhattan. Don’t get me wrong: I’m all for getting the one percent to pay their fair share. But Cuomo doesn’t seems to understand that homeless New Yorkers can’t wait. They need housing solutions now. We gathered to sing, chant and share stories outside the famous “war room” at the State Capitol in Albany – that’s where, ever year, the state’s budget is decided by the Governor and the leaders of the State Assembly and Senate. Those two legislative bodies have already agreed to fund Home Stability Support – the Assembly approved $100 million, and the Senate approved another $20 million for the program, which will issue vouchers to help those facing housing instability stay in their current homes, so they don’t end up on the streets or in shelters. But from Cuomo? Nada. 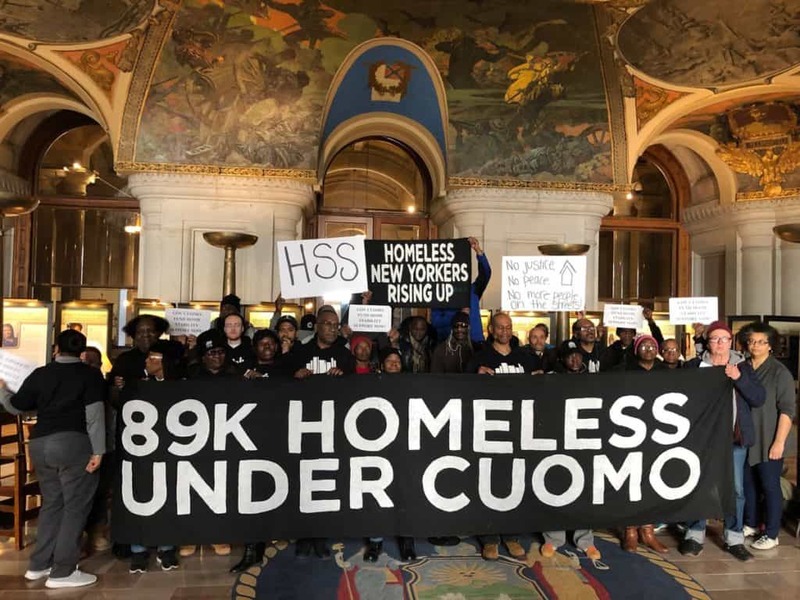 Cuomo won’t budge – even after ten Democratic members from New York’s Congressional delegation, including Rep. Alexandria Ocasio-Cortez and Hakeem Jeffries, who leads the House Democratic Caucus – wrote to him, in support of HSS. New York’s homeless and poor may seem faceless and nameless to you, and their problems far away. The other day, I heard you say that anyone who makes less than $150,000 must be “lower-middle class.” That’s more than twice the median income in the state you govern, and way more than most of your constituents have to get by on. You are seriously out of touch. But they’re not faceless and nameless to me. They’re people like Patrick Braswell, from Rochester, who I sat beside at the protest. Patrick is currently homeless. Governor Cuomo, if you really want to be taken seriously as a progressive leader, then support real solutions for people like Patrick, Nathylin and me. Support Home Stability Support now. Because until New York’s homeless crisis starts to improve, your reputation won’t, either.